You’ll almost certainly find yourself using it every day. When first coming to China, you may find yourself missing the familiarity of WhatsApp. But with WhatsApp being blocked in China, you’ll find yourself using it less and less. Until WeChat/Weixin slowly but surely takes over your life. Having lived in China for 1.5 years now, I can’t remember the last time I opened WhatsApp. Sorry, but the WeChat app trumps WhatsApp in so many ways. If you do find yourself with an urge to use WhatsApp or can’t quite let go – or can’t get your mates back home to download WeChat – you’ll need a VPN to access it. This can either be a paid VPN service or a free VPN service. 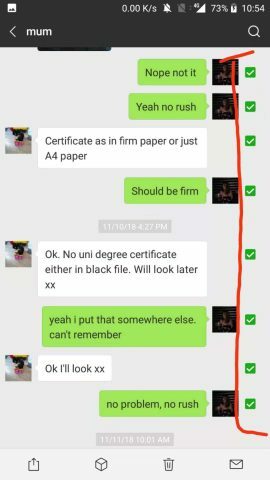 But how to use WeChat and what things can I learn right now? So you’ve been in China working or studying (or both) for a while now, and you think using WeChat every day means that you’ve pretty much cracked how to use the app and make sure you’re getting the most out of the WeChat experience. Well, as a savvy WeChat user you may have discovered all of its best features. If so, congratulations! However, after using it for over a year I am still finding new, super convenient features that no one seems to talk about or use too much. At least in the expat world. So here’s a list of 5 things you may or may not know that WeChat can do, that will definitely change how you use WeChat. The most recent discovery of mine and the inspiration for this blog post, I felt I needed to share. Sending voice messages in China is a common past time amongst Chinese and expats alike. Once you first start using the app, you may not send so many voice messages. But you’ll surely see many Chinese people on the street talking into their phones and sending voice messages since this is the preferred method rather than texting. Use WeChat for a few weeks and you’ll soon realise just how damn convenient it is to send a voice message instead of typing out a massive message. However, I will always stand by the fact that sending a voice message is the most convenient thing for the sender and the most inconvenient thing for the receiver. 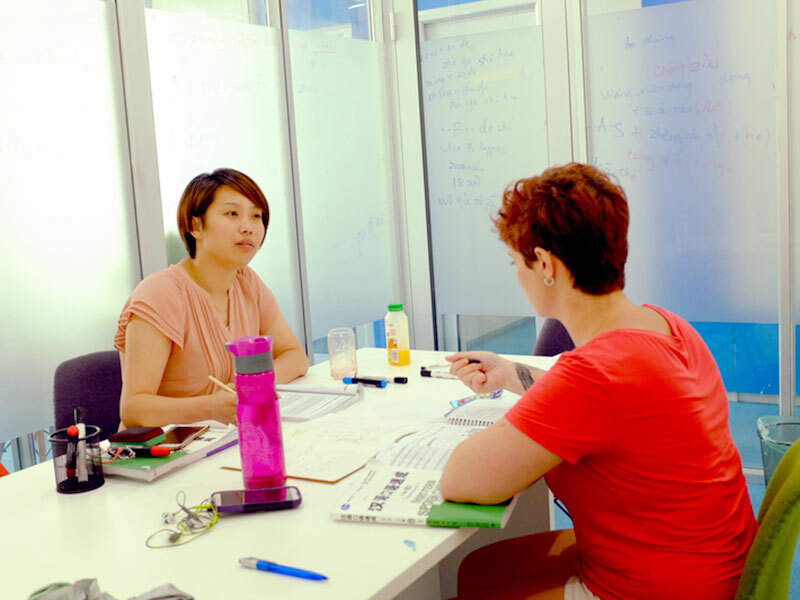 Studying Chinese hard – no time for voice messages! In a lesson or at work? Listening to music or watching a film? There’s no way you can just peer over and see what the message is about. Is it important? Is it your mate telling you a stupid joke? Are you getting fired from work? You’ll never know until you listen to it then and there, disrupting whatever you’re doing. Plus, if it’s super long, (they can be a maximum of 1 minute) then you’ve probably forgotten what has been said at the start of the message anyway, and you have to listen to it again. Moreover, missed something in the middle? There’s no pause and play button, so you’ll have to listen through the whole thing all over again… Damn! Well, apparently there is a way to get around this. Only available in Chinese at the moment, I’m sure this feature will move over to other languages soon. But for now, you can use it whilst chatting with your Chinese buddies. 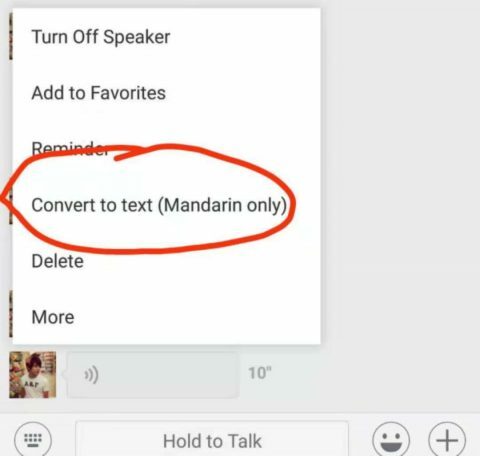 How to use WeChat Voice to Text Converter? Get a voice message from a friend. Click the “Convert to text” button. Looks like I’m going for dinner tonight..! That said, it works pretty darn well! This one is SO USEFUL! If you didn’t already know about this one, you need to get on it. 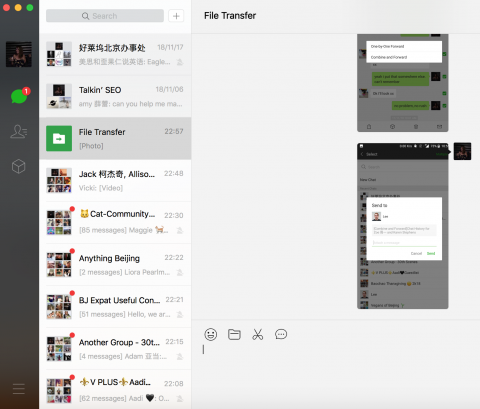 WeChat Web is a great way to type quick messages by using your PC, but more importantly, it means you can do file transfers. Send pictures, videos, links, etc to yourself to have them on your computer. That’s how I got those screenshots up there onto here! Plus, you can use it in the office and pretend you’re working. Just be aware that notifications come up automatically in the right-hand side if you don’t disable them, as well as the first line of text from a message. TIP! – This can be problematic if you have things to hide. Unfortunately, the world we live in means that nothing is kept private. Want something to be as secure as possible and make sure it’s not passed on? Send it in a voice message. Otherwise, chances are that sensitive message will be screen-shotted and sent on to a friend who definitely shouldn’t see it. Take this riveting conversation with my mother, for example. 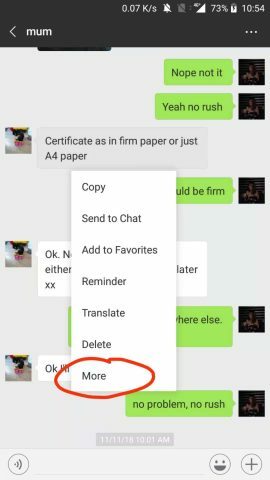 WeChat China: Upon pressing “more”, the chat will come up with a tick box. Choose which point from and until you want to group the chat messages! 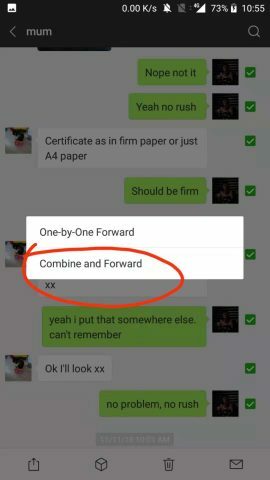 WeChat China: Once you have chosen your messages, select ” combine and forward”. 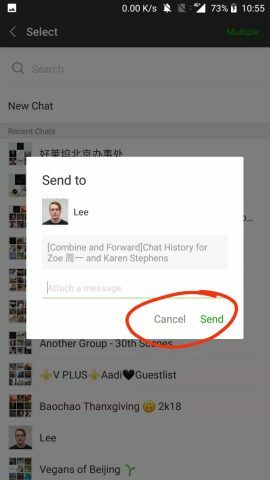 WeChat China: Choose who you’d like to send it to (can select multiple), and there you go! Congrats Lee, it’s a thrilling read. Above all, with great power comes great responsibility. Please use this feature for good, not evil. 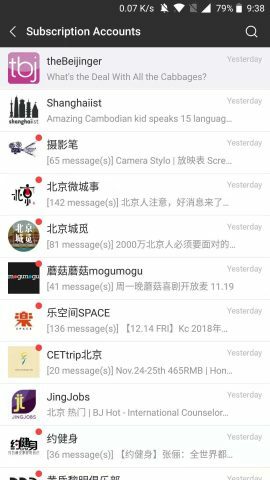 One that you’ve probably come across if you’ve been using WeChat for a few weeks/months, subscription accounts are hand to keep up with what’s going on in the world, or what’s going on near you. They’re accounts that you personally follow, like a social media basis. Many businesses, cafes, bars, and restaurants have subscription accounts, so it’s good to know when they have deals on or events. 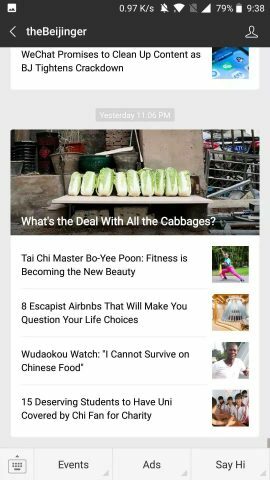 I also find it handy to keep up with the news readying the Shanghaiist and The Beijinger. How do you follow a subscription account? Just search in your search bar for the name of what you’re looking for, and the account will come up. From here, you can follow it and get regular updates! Aside from all the cool stuff you can do on WeChat I went through here, you can also do… Just about everything. So, I’m a strong believer in WeChat in the WhatsApp vs WeChat debate so I may be a bit biased, but there’s so much you can use WeChat for to get the full use out of it. A large section is in the “me” section. Have a browse and see what services would be useful for you! You can do everything from topping up your mobile phone, to hailing a cab, getting a share bike, shopping…. The list goes on! WeChat China: Choose from a variety of options! WeChat China: After clicking “wallet”, you”ll end up here. 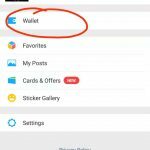 WeChat China: Go to “me” and click ” wallet”. 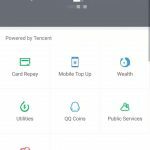 Aside from all of the obvious things that makes WeChat awesome and gives it reason for being the most popular app in China, you now know about some other cool features you may not have know about before! And this is just getting started. How many did you know about before? Leave a message in the comments below! DID YOU KNOW – WeChat features in our Top 10 Must Download Chinese apps but what about the other 9? Zoe is one of the more well travelled individuals we've met at LTL. 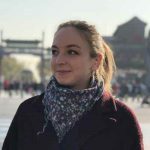 A former (and sure to be future student with us), Zoe now blogs for LTL when she gets spare time. She has a wealth of knowledge across so many subjects as her full time job is a tour guide.